I am privileged to be able to speak at the Sustainable Brands conference in Copenhagen at the end of October 2017- this will be my third SB conference, and I am delighted that SB started a three year initiative beginning with “Redefining the Good Life,” a topic I have put much ink to paper on over the past few decades in several of my books such as The Trouble with Paradise, Synergise! and A Leader’s Guide to Thriveability. The question: "What is good?" has occupied thinkers, philosophers and doers for thousands of years, even before Aristotle put pen to parchment in the days of ancient Athens. In modern times, answering this question is harder than ever, in the light of the historic challenges we face. We live in a highly commercialised world focused on consumption and never-ending economic growth on a planet with finite biophysical resources. The only resources we have that are unlimited are our own potential to learn, develop, innovate, change and transform our world and ourselves. The role of brands and corporations is highly controversial in an increasingly unsustainable world, yet the power of brands to transform our world is also unprecedented. (Hats off to Sustainable Brands for tackling this issue head on). A brand is a promise- at its best, a promise to enhance our lives without costing the earth and other people in the process. Indeed, the most enlightened brands are now promising to make the world a better place as a result of their activities, becoming not just sustainable, but net positive, or even thriveable. The first steps toward sustainability are taken when the leaders of a business become more fully aware of the impact their organization is having on the world. Whether through a crisis, a change of heart, or an Aha! epiphany, leaders and managers everywhere are signing up to make our planet and our lives greener and more inclusive. Making sustainability a priority in an organization always brings benefits, whether reducing waste and costs, improving quality and staff morale or convincing customers and other stakeholders that one’s products and services are worth buying, even at a slight price premium. An overwhelming variety of statistics point to the fact that consumers, investors and suppliers prefer sustainable brands globally. Being sustainable shows the world: "We care". Those leading the charge toward sustainability are to be congratulated, yet the opportunities to do a great deal more are now tantalisingly low hanging fruit thanks to the convergence of connections, knowledge and new metrics enabling the networks of innovation surrounding every industry to spot the pockets of the future in the present, and make them a scalable reality now, organisational cultures permitting. Ever since the publication of the World Business Council for Sustainable Development’s "Vision 2050" report almost a decade ago, it has been clear to most of us seeking to create a safe and just operating space for humanity and all life by 2050, that this is not "Mission Impossible", but "Mission Doable". My own research and work in Renaissance2, the Thriveability Foundation and Project Synergise has benefitted enormously from being able to map out clear pathways toward a thriveable future. 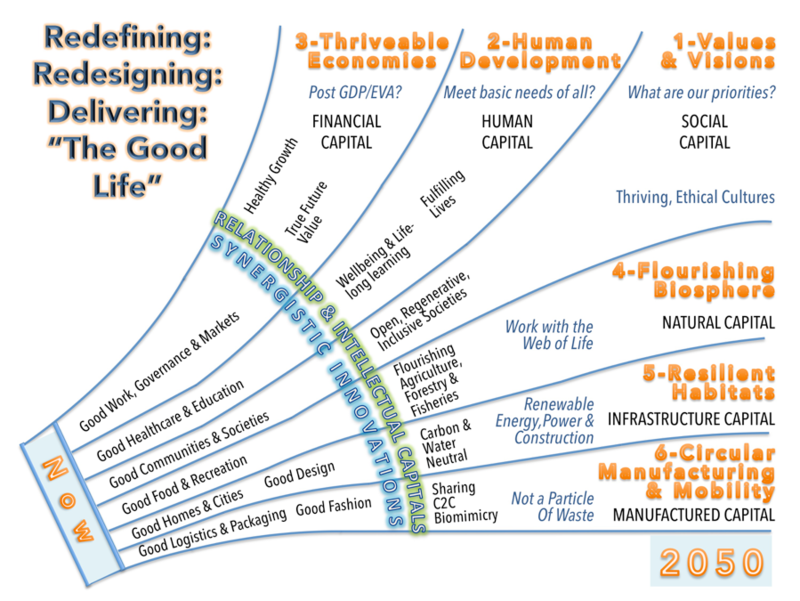 The only critique one can make of "Vision 2050", is that it took a silo-based industry perspective based on existing technologies and industry structures, and failed to account for the dramatic innovative potential of human beings, social innovation and those many billions without a vested interest in the current system. Many readers will be familiar with the old saw that says the creativity helps us discover how to make "1+1 = 3". The concept and practice of synergy, the bringing together of two or more things or people with complementary properties that add greater value than the sum of their parts, is well known. In my own experience, most of the progress in the sustainability movement to date has been driven by incremental innovations that achieve a fairly consistent rate of annual improvement according to what is perceived as "deliverable" in the annual corporate planning and budgeting rounds. Having been the head of marketing and planning for a major corporation myself, I am only too familiar with the pressures that make this a risk-averse process where "downward revisions to previous commitments are not lightly entertained", as one amusing but potentially career limiting head office memo once put it. The most radical, and synergistic innovations usually come out of "green fields" operations, where an entrepreneur spots an opportunity to do something very different to current practices in an industry. In fact, the most radical of all innovations occur in the "white spaces" between existing industries, creating something entirely novel and value adding. Think Apple/Microsoft, Natura/Body Shop, Interface, Nike and Puma, Grameen Bank, Whole Foods, Facebook, Ben & Jerry’s, Aveda, Tesla, Starbucks and thousands of others you have probably never heard of, when you think of the corporate sustainability success stories of Unilever, Walmart, Toyota, Hilton, Coke, Samsung, Ford, IBM, Allianz, Accenture, BMW, Novo Nordisk, Siemens, Zara and the thousands of other global brands that are making a stand on sustainability. The holy grail of synergistic innovation requires an environment that encourages creativity and risk-taking, along with strong incentives to reward those who make the many valiant attempts at bringing brilliant new things and ways of doing things into the world. Innovations that stretch across industry boundaries, or indeed create entirely new industries. Think of renewable energy today versus a decade ago- the debate about the inevitability of renewables replacing fossil fuels is won- though the need for acceleration is still pre-eminent as we find climate sensitivity to green house gases to be much higher than previously thought. Think of electric (and now hydrogen) cars, mobility-as-a-service, with shared autonomous vehicles, and the future of transport in general, with France and other countries banning the sale of fossil fuel powered vehicles from 2040 and even earlier dates elsewhere. One by one the tipping points are being reached in industries old and new. But just as the price of freedom is eternal vigilance, so too is breakthrough innovation the price of a flourishing biosphere and thriving humans. Throughout our sojourn on earth as homo sapiens, we have accelerated and deepened the pace of beneficial innovations as we have increased our knowledge, ability to collaborate and transcend egotistic, ethnocentric and nationalistic boundaries. Making the impossible, possible, is becoming a good habit that defines the past two centuries. And good habits, along with good characters tend to produce good outcomes, if we can stay open to emergence and stay focused on the opportunities. We are also improving our predictive power with global data and information available at our fingertips, in a global commons of breakthroughs. Multi-capital accounting systems, transparent reporting and a concerted crackdown on international cheats and criminals (both individual and corporate) is slowly starting to yield results. We can take and manage risks which would have been unthinkable even a few decades ago, and understand the consequences and impacts with much great clarity and in much greater detail. In this spirit, I have mapped out "Six Pathways to the Future", based on my four decades of research and practice in synergistic/breakthrough innovation, standing on the shoulders of giants to see further. The diagram below summarises the in-depth research and conclusions of my three most recent books Synergise!, A Leader’s Guide to ThriveAbility and The Great Shift- Catalysing the Second Renaissance. I am delighted to be able to present this work in Copenhagen at the Sustainable brands conference from 30 October to 1 November 2017, and hope to inspire the participants there to explore a new job role in their organisations as "Acrobats of the Impossible". My own promise is that the occasion will also be enjoyable and practically rewarding!